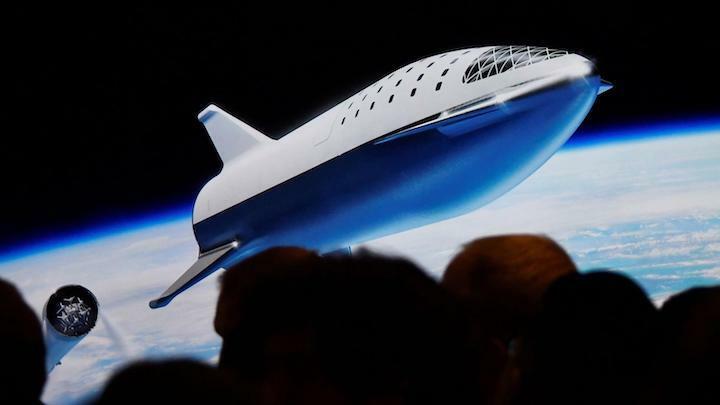 SANTA FE, N.M. — SpaceX Chief Executive Elon Musk says a redesigned test vehicle for the company’s next-generation reusable launch system could be ready for initial flights early next year. 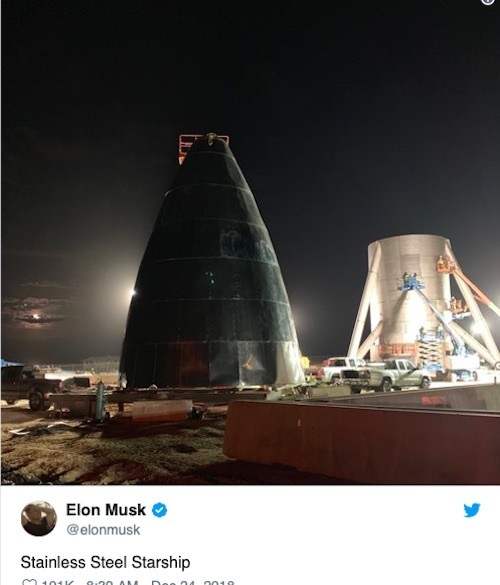 In a tweet early Dec. 24, Musk posted a photo of two parts of that initial test article, a conical section next to a cylindrical unit with landing legs. “Stainless Steel Starship,” he wrote. The company has been working on a Starship test article for low-altitude flight tests at the company’s South Texas launch site under development. That test article, dubbed a “hopper,” would have the same nine-meter diameter as the full-scale version of the vehicle, but would not be as tall. The company filed an application with the Federal Communications Commission Nov. 19, seeking an experimental license to support communications with the hopper during upcoming flights. SpaceX said it planned a combination of low-altitude flights, going no higher than 500 meters, and high-altitude ones, going as high as 5,000 meters, from the Texas site. The company didn’t disclose a schedule for the flights in the application but said it expected to need the license for two years. Musk and other company officials have said those hopper flights would begin in late 2019. However, Musk tweeted Dec. 22 that he expected those flights to begin as soon as early next year. “I will do a full technical presentation of Starship after the test vehicle we’re building in Texas flies, so hopefully March/April,” he wrote. The recent series of tweets from Musk also confirmed a change in materials that will be used to build the vehicle. Original plans, dating back to designs presented in 2016 and 2017, called for the use of carbon composite materials, which are lightweight but have high strength. Earlier this month, though, Musk said SpaceX had shifted to a “fairly heavy metal” for use in the vehicle. That metal, he said, is stainless steel, in particular a family of alloys called 300 Series known to maintain its strength at high temperatures. Despite being heavier than carbon composites, Musk said that stainless steel offered “slightly better” strength-to-weight performance at cryogenic temperatures, needed for the vehicle’s liquid oxygen propellant tanks, and was “vastly better” at high temperatures. He acknowledged that steel was worse than carbon composite at room temperatures. The test hopper will be powered by three of the company’s Raptor methane/liquid oxygen engines under developments. Those engines, which the company has been working on for several years with some financial support from the U.S. Air Force, has undergone design changes as well. “Radically redesigned Raptor ready to fire next month,” he tweeted, not elaborating on those changes. Elon Musk has a plan to get to Mars, but how he’s going to get there keeps changing. Over the weekend, the SpaceX CEO said the company had “radically redesigned” its Raptor engine, casting a new steel alloy to contain the hellish engine temperatures during liftoff, and swapping out carbon-fiber components for ”mirror-finish” stainless steel. Musk said SpaceX is switching to stainless steel components because their performance under extreme heat and stress beats out that of carbon-fiber. While carbon-fiber is better at room temperature, Musk stated the extreme heat and cold of space made steel superior despite the added weight. SpaceX engineers are also finishing a “superalloy foundry” at the company’s Hawthorne, California headquarters for its methane-fueled rocket engine known as the Raptor. The metal components must endure hot gas blasting out of the nozzle at 12,000 psi (the same pressure that exists at the deepest part on the ocean). “I super ❤️ 300 Series Stainless!,” Musk tweeted about the hardened steel alloy. 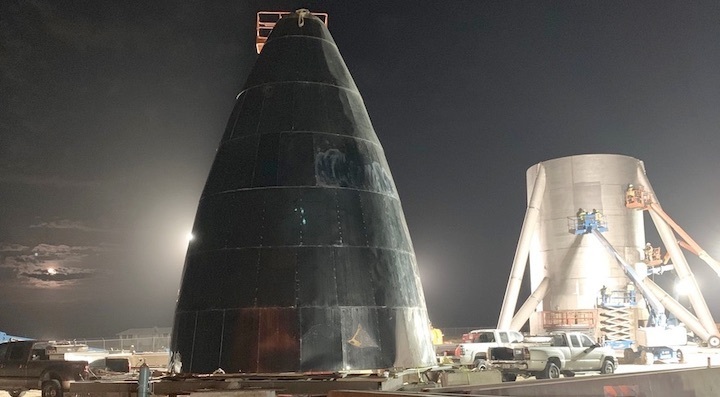 Musk was visiting SpaceX’s South Texas test site to gauge progress on the massive two-stage reusable Starship rocket system that will power it to Mars. The system is the Starship passenger craft atop a massive booster engine know as the Super Heavy. It is designed to carry as many 100 people and tons of cargo to Mars. An illustration of the Super Heavy booster and Starship craft. For early tests, SpaceX had planned to use a modified second stage of its Falcon 9 rocket. But Musk tweeted on Dec. 22 that test craft will fly atop a full-size Super Heavy booster, and the prototype Starship itself will now be a slighter shorter version of the final design with the full body diameter of 9 meters (30 feet). SpaceX is racing to build out its prototypes so it can fly to orbit by June 2019. It is expected to fly several test flights in April. These “hops,” or sub-orbital trips, will allow engineers to test the craft as it leaves Earth’s atmosphere and then endures the heat of re-entry, a critical trial for trips to the Red Planet.